A few weeks ago I found a gorgeous photo of a recipe that sounded really good on Saveur, so I tweaked a few things, baked some beets and made a big jar of these beautiful pickled beets. Unfortunately, it turns out that I'm not a huge fan of apple cider. Oh how I wish I had known that before I submerged a half dozen gorgeous baked beets into it. It's not bad with a slick of balsamic though, and I'm not one to waste anything, so I've been tossing it into salads, beet by beet. But here's where I convince you to make that not so stellar recipe: it makes the most beautiful deviled eggs! They're like the every day picnic in the park variety, but with lipstick and an evening gown on. Gorgeous little she devils. I marinated the eggs overnight and while the recipe does say that you can keep them in there up to 5 days, I would say don't overdo it. The vinegar does make the whites a bit rubbery, so you just want them to absorb the color and a touch of the vinegar flavor, then fish them out. The rest is up to you. Use your favorite deviled egg recipe or use the one I've listed below. I promise, a plate of these is sure to dress up any buffet table. - Hard boil the eggs, allow to cool slightly and peel. Drop into the beet brine and leave in fridge for a few hours or overnight. - Fish out the eggs and lightly pat dry with a paper towel. I didn't and I had little pink spots everywhere. Cut in half and pop the yolks into a bowl. Set the pretty pink egg white halves aside. 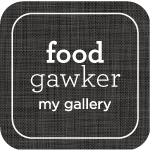 - Add the remaining ingredients to the bowl of yolks and mash everything together with a fork. - Scoop the mixture into the pink egg white halves or pipe it in and serve! Those look AMAZING. And I'm glad you achieved that color naturally, that's fabulous. 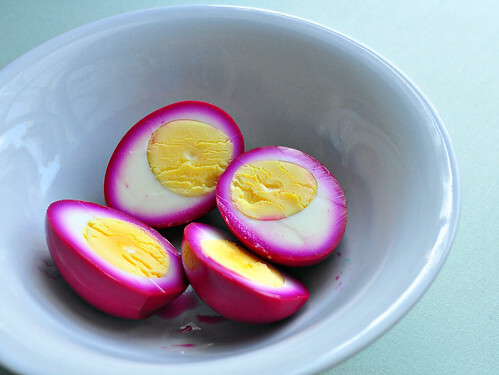 You can use vinegar instead of apple cider - pickled hardboiled eggs are slightly firmer and taste wonderful. 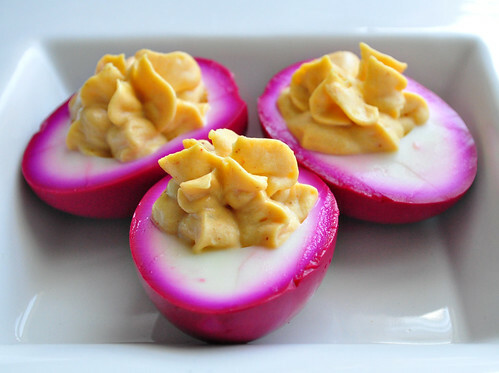 I love love love deviled eggs, and for whatever reason I've not tried this version yet. 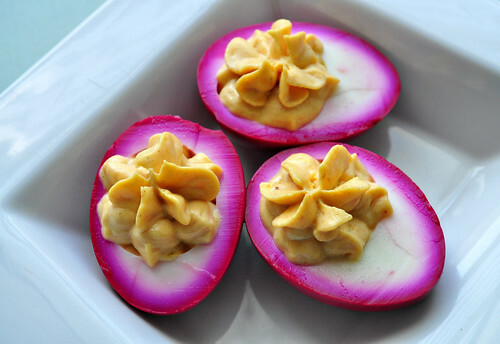 But beet pickled deviled eggs are just about the prettiest snack in the world! I love that you made them. Wow, those marinated eggs are really gorgeous *O*!! I have made these & grew up eating these at my summer job. When I made them for the family this year they told me to never do it again - I wonder if maybe I left the eggs in the beets too long. Yours look amazing, thanks for sharing!! I LOVE this idea! I'm totally going to try this soon. I love deviled eggs! Looks good for eyes and delicious for breakfast ... Light dinner.